A debut novel about Thomas Jefferson and Sally Hemings, in whose story the conflict between the American ideal of equality and the realities of slavery and racism played out in the most tragic of terms. Novels such as Toni Morrison’s Beloved, The Known World by Edward P. Jones, James McBride’s The Good Lord Bird and Cloudsplitter by Russell Banks are a part of a long tradition of American fiction that plumbs the moral and human costs of history in ways that nonfiction simply can't. Now Stephen O’Connor joins this company with a profoundly original exploration of the many ways that the institution of slavery warped the human soul, as seen through the story of Thomas Jefferson and Sally Hemings. O’Connor’s protagonists are rendered via scrupulously researched scenes of their lives in Paris and at Monticello that alternate with a harrowing memoir written by Hemings after Jefferson’s death, as well as with dreamlike sequences in which Jefferson watches a movie about his life, Hemings fabricates an "invention" that becomes the whole world, and they run into each other "after an unimaginable length of time" on the New York City subway. O'Connor is unsparing in his rendition of the hypocrisy of the Founding Father and slaveholder who wrote "all men are created equal,” while enabling Hemings to tell her story in a way history has not allowed her to. His important and beautifully written novel is a deep moral reckoning, a story about the search for justice, freedom and an ideal world—and about the survival of hope even in the midst of catastrophe. Stephen O'Connor is the author of two collections of short fiction, Here Comes Another Lesson and Rescue, as well as Orphan Trains, an acclaimed history of a pioneering nineteenth-century child welfare effort, and Will My Name Be Shouted Out, a memoir. His fiction has appeared in many publications, including The New Yorker and The Best American Short Stories. He lives in New York City and teaches in the Columbia University and Sarah Lawrence MFA programs. “Ambitious doesn't begin to describe the scope of the project O'Connor undertook. And successful doesn't begin to describe the wildly imaginative techniques he used to realize his authorial goal, which is clearly to humanize — equalize, you might say — the two members of this passionate, conflicted couple . . . What makes these literary gymnastics work is, in a word, talent . . . What justifies the risk is his insistence on using a full palette and tiny brushes to draw these characters, rejecting broad brush strokes in black and white. 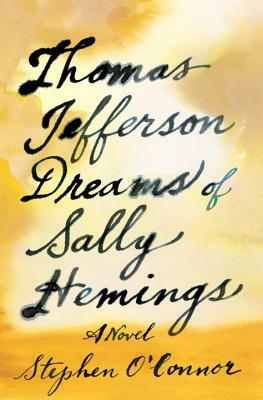 Rendered in all their complex, contradictory glory, Jefferson and Hemings seem to stand up on the page.’"
“A brilliant, huge-hearted act of the moral imagination. O'Connor has written a kind of quantum historical novel--simultaneously fiction and nonfiction, wave and particle. With dreamlike fluidity, the story moves from the real halls of Monticello to Jefferson's musings in the afterlife, from meditations on the phenomenology of color to what the theft of dignity means. This book creates new facts to live by; it's stranger and braver than I know how to describe. Open to any page and you will see what I mean." "This is an extraordinary book. It imagines the most intimate aspects of slavery in the way only fiction can—everything is freshly shocking and freshly human. And its wildly original use of dreamscape, fabulism, and philosophy gives us the layers these characters deserve, as it reinvents the historical novel."